The DTEA1045 series of AC/DC desktop power supplies offers up to 45 watts of output power in a 3.94” x 1.77” x 1.22” package. This series consists of single output models with a wide input voltage range of 100 to 240VAC and optional input inlets. Each model in this series has LED indication, USB Type C, meets DoE level VI, has over voltage, over current, optional over temperature, and short circuit protection. This series has UL/cUL, CB, CE, FCC and CCC safety approvals. Notes: 1. “X” in model number indicates AC inlet type. 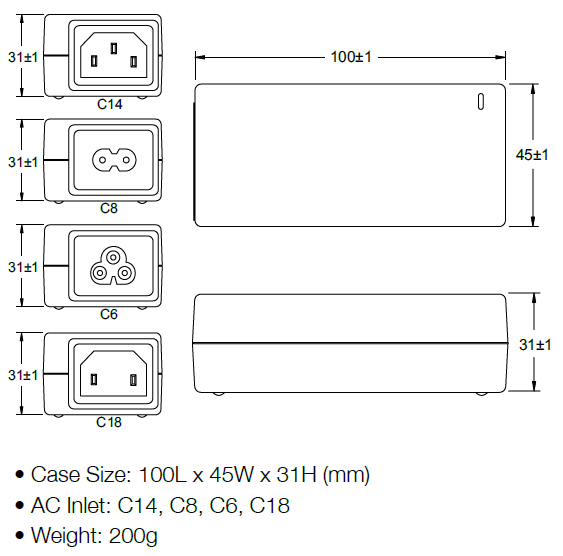 “X” can either be “1” for IEC-320-C14, “2” for IEC-320-C8, “3” for IEC-320-C6, or “4” for IEC-320-C18. 2. Ripple & Noise is measured by using 20MHz bandwidth limited oscilloscope and terminated each output with a 0.1uF ceramic capacitor & parallel with 47uF aluminum capacitor at full load and nominal line.